Thanks for the like and for dropping by my blog. 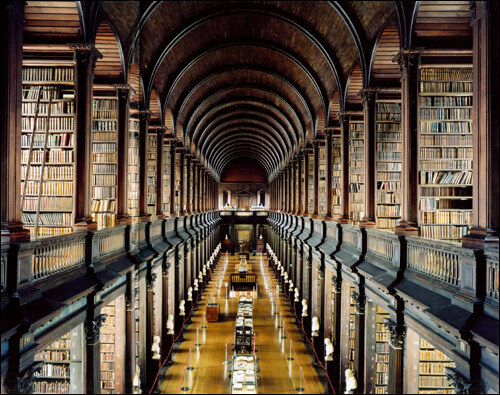 I absolutely love that picture of the library – how I wish I owned all those books. I would never get out of there! That library was in my university! It’s full of ancient tomes and there are usually interesting literary or historical exhibitions there, too. Plus, the Book of Kells is just downstairs. If ever you’re in Dublin, go have a look – it has become one of the city’s attractions. I WISH I owned a library like that!! I really like this poem, it’s got a great style and I can picture myself gaining the knowledge that you have written about. I shall definitely be following your blog! Thanks also for dropping by my blog, hope you continue to do so. Best wishes. I will blog on it soon!! Ever read Borges’ story “The Library of Babel”? It’s what your photo brought to mind. Beautiful. I love the picture as well. I tend to think the same way, but somehow the picture made me wonder whether it would actually be a nightmare to own all those books. Think of the feeling of responsibility to read them all and the hopelessness of ever managing to do so! very good poem and image! I love books. So do I need to go to a BBB meeting? Books Books (and more) Books. You’ve made me miss the libraries I knew when younger. Quiet places full of hushed turning of pages and smothered coughs. Ours now is a more child friendly affair that is often noisy and bears no resemblance to my associations of what a library is still in my mind. First, I loved your picture all of the books. In my dream life I would love to grab a cuppa tea, coffee, etc. and read every single book. I loved reading your poem. It fit so perfectly with the photo. Wonderful post. Thanks for the like and for enabling me to find your blog. I love this poem, it is such an amazing experience getting ‘lost’ in a library where time becomes irrelevant … Until you have to leave!